A Burroughs Adding Machine in the Telegraph Office of the Station. Long before the day of Office Computers and Digital Adding Machines there were mechanical adding machines using cogs, wheels, levers, and gears. This is an early adding machine which could add up columns of numbers keeping a list of the numbers and the totals. The Burroughs Adding Machine also could come equipped with a direct subtraction device. 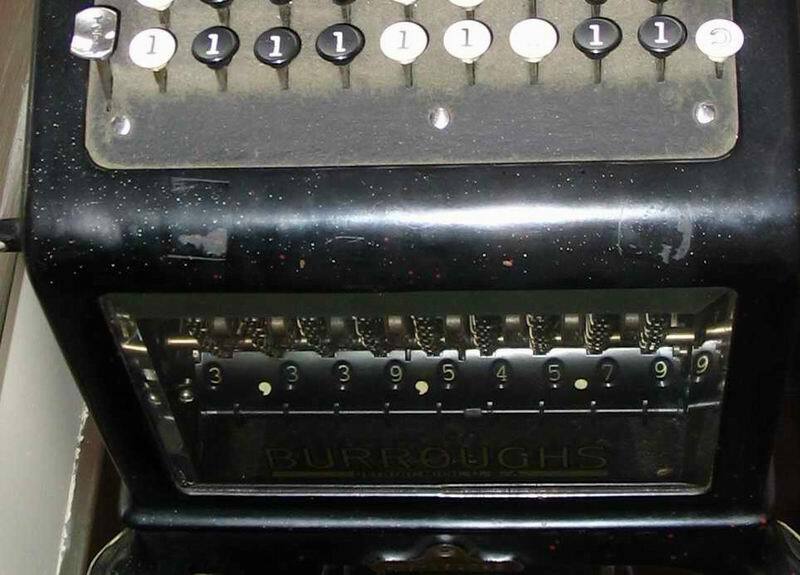 The Burroughs Adding Machine was known as a “blind” printer because the printer was on the back of the machine and not visible to the operator who would have to “lift a carriage on the rear of the machine to see what was printed.” The operator could read a running total on a register behind the glass front of the machine. This Burroughs Adding Machine along with the typing float, typewriter, and telegraph were staples of the telegraph office. There were also calculators which could do multiplication and division, however they didn’t create printed lists. This font is difficult to read. Please use a sans-serif font. On occasion some fonts which are standard on computers – and are even included in the handful that are consistently handled by web browsers – are handled differently on individual computer set-ups. This can be hard to predict sometimes. Courier is one of the standard fonts used on the web for body text, but sometimes things can be set up differently on a system and it is substituted by something less readable. For this article I decided to use the Courier font as this is a standard font used on typewriters in earlier times. That was to give a flavour of old style business machines. It is interesting to note – as a writer and web designer – that in Europe san-serif fonts are considered easier to read while in North America, as a rule, serif fonts such as Times New Roman are considered the easier to read. Courier is often still used as an equal width font on systems. Courier might seem unusual today to people used to Arial and Times New Roman. I might see about resetting the article’s font leaving the first paragraph for flavour. In this blog you may see a number of fonts, some serif and some san-serif for different purpose. I am referring to body text – there are also many fonts which are restricted to special purposes such as Titling and page decoration. I will often use the default font here which is a san-serif family of fonts including Arial. However I also use the serif family including the familiar Times New Roman. For a less formal look I use Comic Sans MS. For the impression of something typed in the 20th century – especially the first half of the 20th century I use Courier. If there is a rare need for artistic material I may use Black Chancery which is one of the more readable of the fancy hands. I still do endeavour to keep things legible and do keep this in mind. I’ll consider increasing the font size if I do work with Courier in future. But, I’ll probably be using serif as well as san-serif fonts in the articles of this blog. In my research as an editor I have found that probably as many prefer serif as san-serif. I also made a choice to include variety in appearance from one blog item to the next rather than going for a completely uniform appearance. I wanted it to look like a collection of articles rather than a single publication. The point being that the articles come from a number of sources. (or that is the goal) Just as not every magazine uses the same font and clippings from a number of magazines would have different fonts, so do the articles in this blog. They are like news clippings. I will try to keep to familiar fonts and do endeavour to keep the text readable by including white space and large enough fonts. I’ll also try to remember to keep any fonts that might be considered out of the ordinary at a slightly larger size and also not for long stretches of unbroken text. PS the text window in this browser that I am composing this message in, is using Courier for composition. It’s the font that Blogger has chosen for the edit window. They are using a san-serif font for the page outside the composition window.